We spent the week cutting thick bramble runners and digging out bramble roots with a pickaxe, raking and digging and smoothing the ground, enduring the amusement of neighbors who came by offering their supplies of Round-up herbicide. Like any simple problem left unattended for too long, the bramble roots ran deep and the thorny vines fought their removal. Underneath one very large mass of vines, I found a decaying tree root that put up real resistance to the pickaxe. Why? Because embedded in the old tree root was a rusty pot. 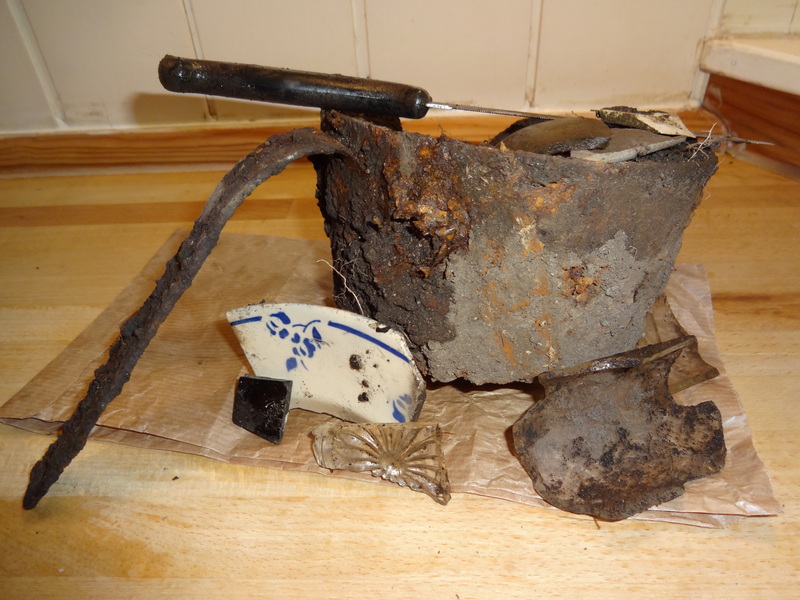 And all around the pot was the detritus of home life that had been put here back in the 1940s or thereabouts. 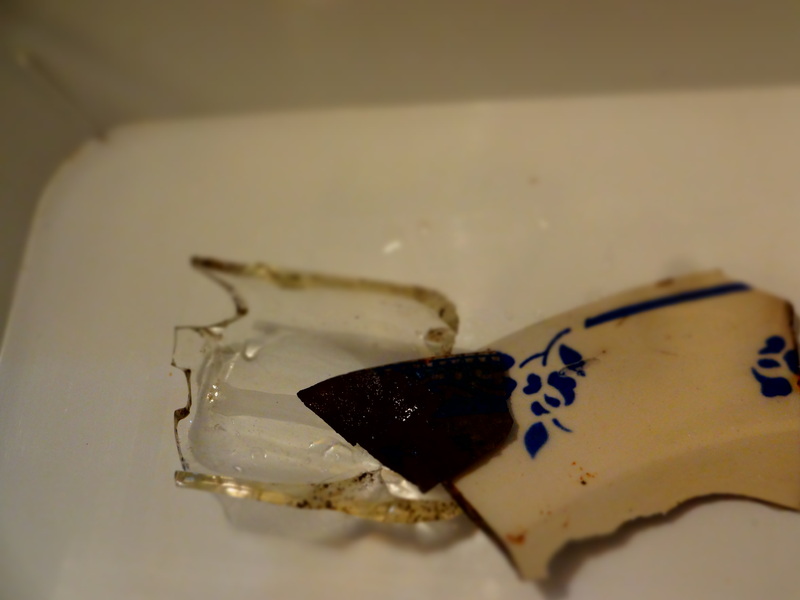 A couple of crockery shards, some glass bits, a plastic-handled knife that is definitely from a more recent time, the old pot. The stuff from under the tree root. Note the pickaxe hole punctured in the side of the pot. This past week, I’ve been working on a corner of the garden that’s always been my bête noir, a ragged patch of annoyance. Our small garden, not directly adjoining our house but opposite the driveway, was once the home of the village ovens. The stone ovens were taken down by the first foreign owner when she bought the house and its property back in the 1970s. But this little house and plot of land have been inhabited and worked since the 15th century. 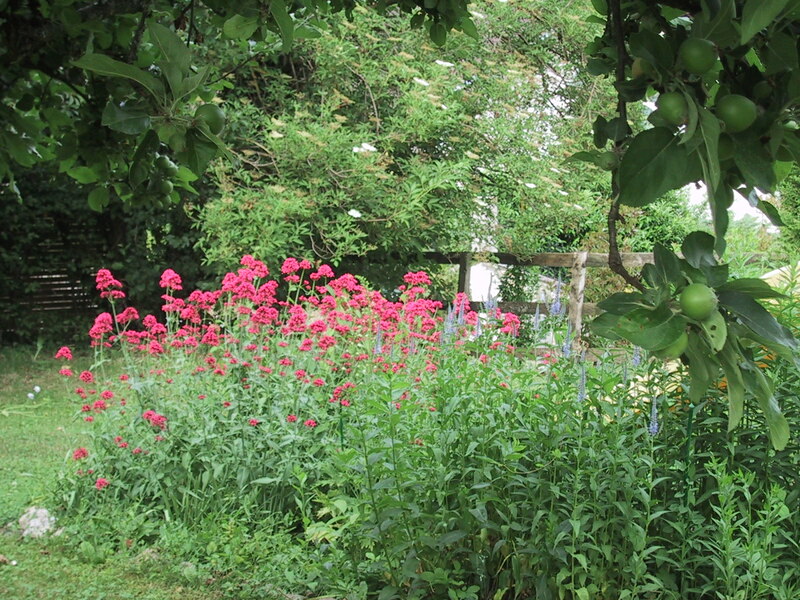 The garden, when we moved in, had seen a few owners come and go since the ovens came down, and each gardener only added, they never took away. By the time we got here, there were corners that had been thoroughly overplanted and then neglected, hedges that had gone untrimmed, brambles that had multiplied unhindered. It was a glorious mess around the edges, which were encroaching on the tidy middle section. We’ve been reluctant to do anything over the years because I liked the crazy romance of it all, but beating back the bramble jungle became too much. So over the past year, we’ve been streamlining. Those raspberry canes that were stunted and fumbling under a cherry tree grown too large? Gone. The nine flower beds (9!) that were choked with ground elder? Gone. The new raised beds that carry my signature gardening style of ‘Haphazard’ are easy to maintain and require less water. The pebbled path that runs the perimeter of the garden where the sun rarely shines is free of moss and weeds. The herb garden is a collection of pots and containers. But that one stretch of hedging that runs along the road, that part remained old garden. Thick brambles between five different hedge bushes, fronted on our side by a decorative veil of peonies and roses meant to distract from the other stuff. Sure, we could just dig the whole thing up and slap down a lawn. We used to think we might find a pot of gold in the garden, some buried treasure or at least an interesting cache of old jewelry or coins that someone in all the centuries of this land being gardened might have left behind. 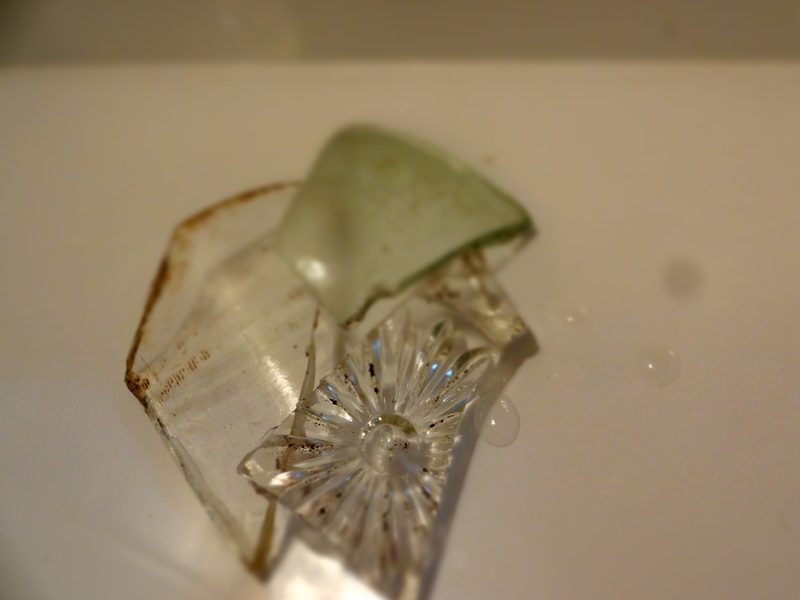 So far, it’s been mostly shards. I did once find a pre-WWI French centime, which I gave to a neighbor who had been born in that year, 1912. Still, every time I come across the remnants of our predecessors, I have the sense that we are a part of something longer, something with a backwards and a forwards. An awareness that we’re the current bead in the pearl string of gardeners here, which is its own kind of treasure.